A Kentucky man wearing a narcotics-themed t-shirt was arrested last night for marijuana trafficking following a traffic stop, police report. A search of Andrew Anderson’s vehicle turned up packages of pot and cash that investigators concluded represented the proceeds of drug sales. 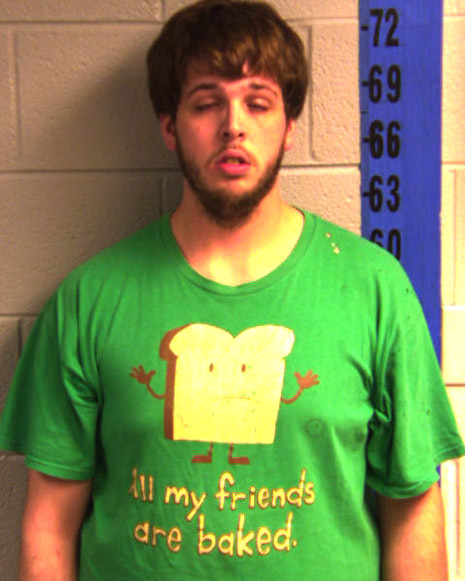 As seen in Anderson’s booking photo, the 22-year-old had on an “All my friends are baked” t-shirt when collared. During a subsequent search of Anderson’s home in Wingo, police seized more marijuana and assorted drug paraphernalia. Anderson was charged with marijuana trafficking and possession of drug paraphernalia, both misdemeanors. He was also cited for a vehicular violation for failing to properly signal. Anderson was released from custody today after posting $2500 bond.